Meanwhile, in Bristol, Connecticut, two milestone events transpired: the Entertainment and Sports Network (ESPN) took to the airwaves for the first time, and young William King made his debut at Fourslide Spring Products. Bill studied his craft at Wilcox Technical High School, finishing fifth in his class and achieving distinction as a National Merit Scholar. He went on to an apprenticeship at Tooling Technology in Meriden, where he made the acquaintance of Rick Powers. Rick subsequently moved to Fourslide, where he had responsibility for both the tool room and the production floor. When Bill completed his apprenticeship, Rick hired him as a junior toolmaker, having recognized Bill’s talent and potential. 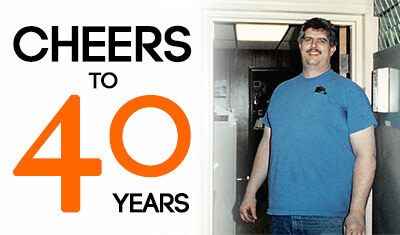 Over the course of his 40 years with the company, Bill has served as toolmaker, working leader, and Chief Tool Designer. Aside from designing, building, and applying countless tools, he was instrumental in the introduction of CAD in tool design and the implementation of wire EDM – two processes that are critically important to the success of Fourslide today. Today, Bill serves as Chief Tool Designer and lead EDM programmer, and he is a key contributor to inquiry review and proposal processes. He serves as a valuable resource for the next generation, helping to ensure the future of the company. Over the years, Bill has witnessed many changes. Fourslide Spring Products employed 20 people in 1979, occupied 6,000 square feet, and had sales of $900,000. Forty years later, the company – renamed Fourslide Spring & Stamping in 2003 – now employs 25, occupies 20,000 square feet, and topped $7.5 million in 2018. Arthur Funk, Sr., the founder of the company, was President when young William came aboard. Mr. Funk’s grandson, Bryan, now serves as President. Only Judy Schmidt, co-owner and daughter of the founder, has more seniority than Bill. Bill and his wife of 35 years, Jan, reside in Bristol, with no plans to leave anytime soon. That’s good news to all of us here at Fourslide.